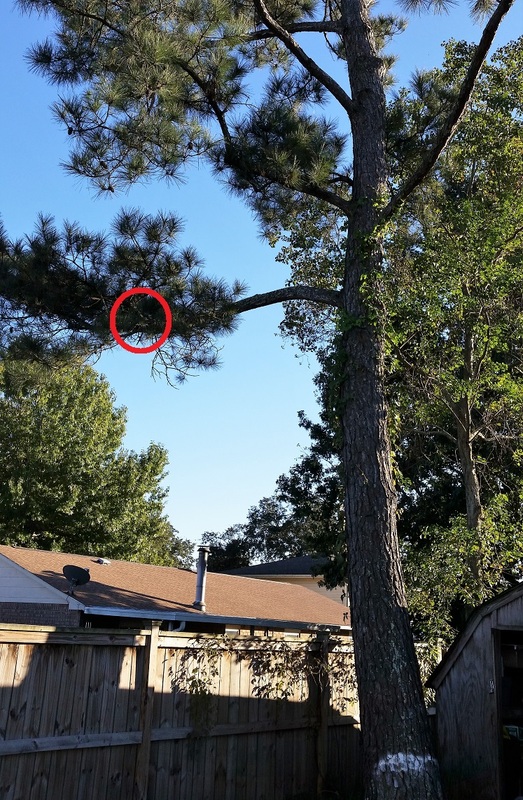 I was at home preparing to go rescue Alora when I got a call from Pam at the St. John Parish Animal Shelter in LaPlace asking if I could rescue a cat in a tree near there. 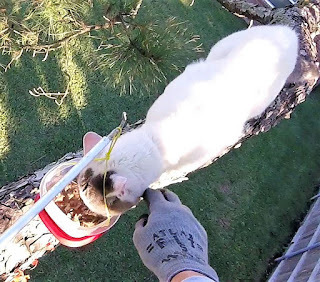 Someone had reported seeing a cat that had been stuck in a tree in someone's backyard for two nights already. The cat was unknown, but Pam said they would take the cat once I got it down. She had already talked to all the neighbors involved and got permission for me to be there and rescue the cat. I told Pam that I had to rescue Alora first, but I would be there as soon as I finished. However, since I never know beforehand how long any rescue will take, I warned her that I may not be able to get there until the next morning. Fortunately, Alora's rescue went fairly quickly, so I called Pam and told her I was on my way. When I arrived, I met Shanta, the homeowner, who graciously allowed me into her back yard where I found a white cat about 20 feet high sleeping deeply on the lowest limb of a pine tree which was near the back fence. The cat was totally quiet and motionless, apparently either too sleepy or exhausted to care. Shanta told me that the cat had been crying to her earlier, so that was a good sign. 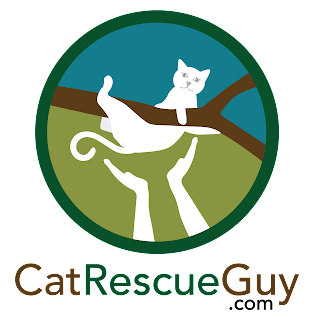 To my surprise, Deana, with the animal shelter, also arrived to watch the rescue and take the cat with her to the shelter once I brought it down. 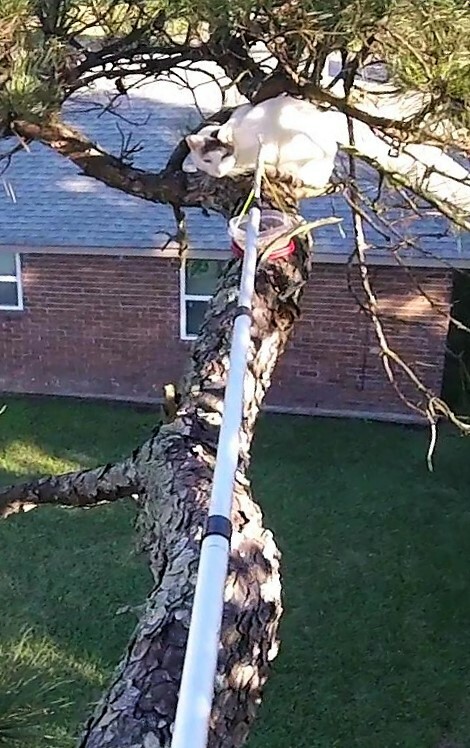 I installed my rope on a branch well above the cat while hoping that he would be too sleepy to notice. But he did notice, and it disturbed him enough to groggily move to another limb in the opposite direction reaching over the fence into the back neighbor's yard. 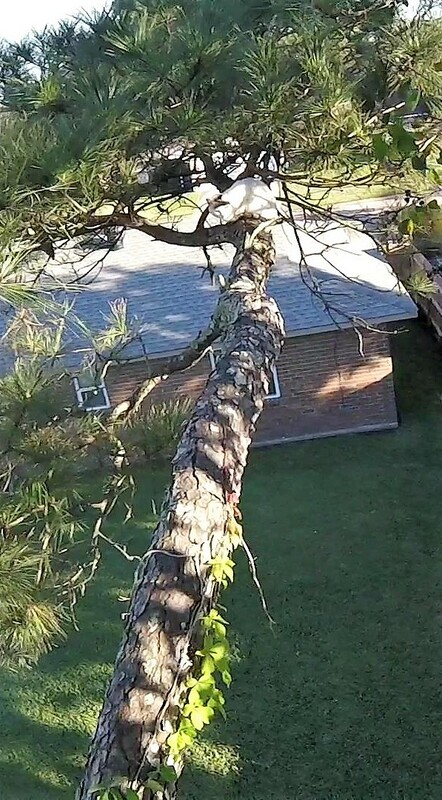 He walked out that limb about eight feet, settled there and closed his eyes to continue his nap. 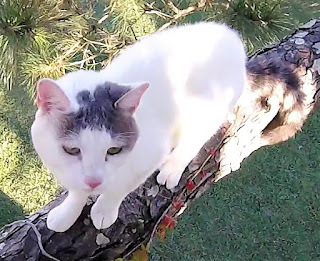 I finished my preparations and climbed up to his branch. The cat was not very far out on the limb, and I could have walked out there to get him, but I had some concerns about that. I had no information about this cat and could not predict his reaction to me, and since he was still not paying attention to me, I was concerned that I might get close to him before he noticed. I did not want to startle him. 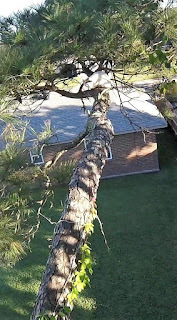 Since he was now hovering over the neighbor's fenced-in yard, if he jumped or fell, we would not be able to catch him. I chose to see if I could lure him to me with food, but first I had to get his attention. I opened a can of food, but he had no reaction to that sound at all. I held it out to him, but he kept his eyes closed and didn't see it. I put the food on the end of an extendable pole and slowly moved it closer and closer to him. He opened his eyes and saw it but did not react to it in any way. I pushed it closer to him, but he still did not react. It was not until I placed the food by his nose that he finally awakened. Slowly his sleepy stupor dissolved, and he stood up to get a better sniff. Now he realized that this was what he had been so desperately craving, and this was his chance to eat at last. He began to vigorously gulp down some food. I let him have a gulp and then tried to pull it closer to me, but it was difficult since he was keeping his head buried in the bowl. I repeatedly pulled it away from him and placed it back down on the limb in front of him to get him to walk toward me while occasionally letting him have another bite for a reward. He followed the food all the way to me, and once he was close to me, he showed no concern about my presence at all. I reached down and petted him while he continued to eat. This was just what I wanted. I was very grateful to Deana for being there to take him to the shelter for me. She saved me a trip. 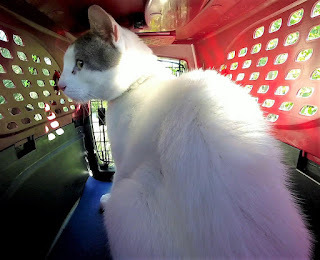 She expertly transferred the cat to her own carrier and, while doing so, also determined that the cat was an intact male. He appears to be a tame cat and may belong to someone who is missing him. If so, the shelter will find the owner and reunite them. If not, they will neuter him and take care of him until he can be adopted. 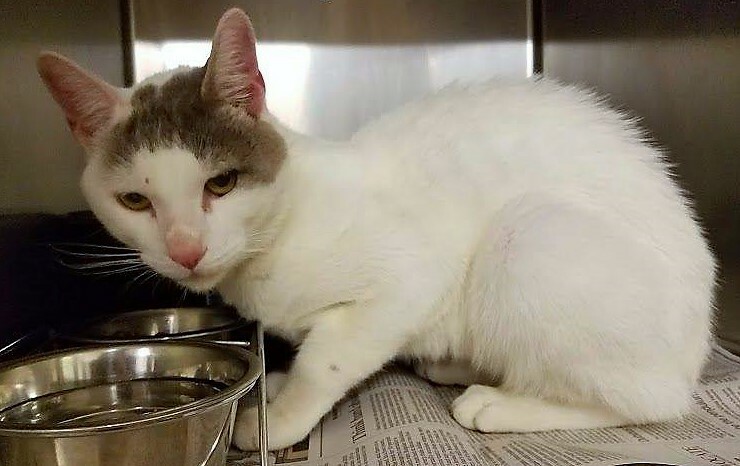 He seems like a very sweet and likable cat, so I'm sure he will find a good home. In the meantime, they have temporarily named him Pine Cone.